The DEAL family join the GIBBENS family with the marriage of William Deal b: 26 October 1828 in Barham and Amelia Gibbens b: 2 December 1832 in Westmarsh,. They married on 7 Feb 1852 in Wootton, Kent. ...................................................................10 Eileen Deal	b: 1922	. 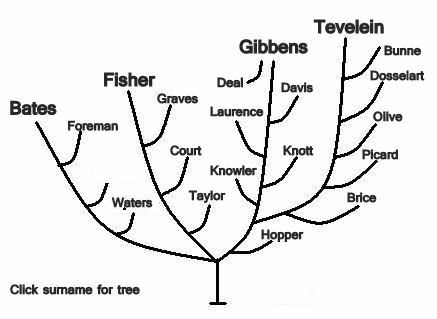 My sincere thanks to Arthur Cook for authering the DEAL tree. It contains an enormous amount of detail. I know this and all his other contributions to this site represent a collosal sacrifice of his time and comfort in preparation.